Part 3 Be aware, this clip has scenes of the horrific accident opposite the pits. A 10 minute British Pathe newsreel showing scenes from Le Mans 1955, Alpine Rally 1956, the record breaker EX181 in action at the Bonneville Salt Flats, Utah. The clip ends with footage of the Twin Cam being tested at the MIRA track. This 20 minute newsreel was a promotional film made for the British Motor Corporation featuring the team of 5 MGAs competing in The 1956 Alpine Rally. Lots of “in car” shots including the Stelvio pass. Another Pathe News clip from October 1955 showing the MGA as one of five production cars from the British Motor Corporation each attempting to complete 100 miles in one hour at the Montlhery banked track. 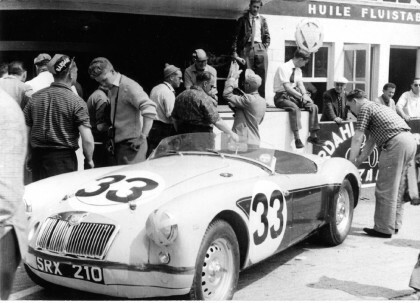 A short Pathe News clip from June 1959 includes a brief shot after about one minute of car no 33 the MG Twin cam of Ted Lund and Colin Escott. The car was forced to retire after hitting a dog on the Mulsanne straight. These photographs of the race are from the MGA Register archive.